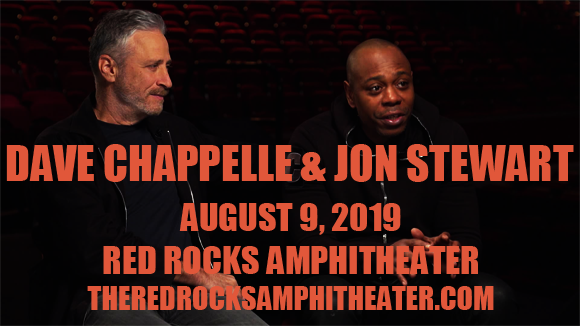 After touring with singer, songwriter and guitarist John Mayer last year, comedian Dave Chappelle is embarking on another co-headlining tour for summer 2019, and this year he's teaming up with former Daily Show host Jon Stewart! The two comedy legends are headed to Red Rocks Amphitheater on Friday 9th August 2019 for a hilarious takeover that will leave you in stitches! Do not miss your chance to see this riotously funny pair live! Originally making his name on the comedy circuit in the early 1990s, American stand-up comedian, actor, writer, and producer Dave Chappelle is best known for his sketch comedy television series, Chappelle's Show (2003 – 2005). Making his film debut aged 19 in Mel Brooks' Robin Hood: Men in Tights (and that same year performing as soul singer Aretha Franklin’s opening act at a number of shows), Chappelle went on to have minor roles in The Nutty Professor and Con Air in the late 90s, before landing his first lead role in the 1998 cult stoner film Half Baked. He co-wrote half-baked with Neil Brennan, who he also worked with on Chappelle's Show. In 2013, Chappelle returned to stand-up , co-headlining with Flight of the Conchords during the Oddball Comedy & Curiosity festival. In 2017, he partnered with Netflix to release two comedy specials – his first in 12 years.